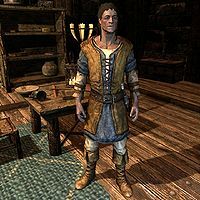 The Desperate Gambler is a Nord warrior who may appear in the Windhelm Barracks during the quest The Dark Brotherhood Forever. He will only be enabled if the Night Mother picks him as the contract giver. He will be chosen randomly from a list of ten people who performed the Black Sacrament and want someone killed. When approached, he will choose between a total of ten possible targets, hand you a leveled amount of gold and blindly expect you to carry out the task. He wears a set of farm clothes along with a pair of boots. He carries a copy of A Kiss, Sweet Mother and wields an iron sword. He shares his dialogue with the ten other potential quest givers; see this section for details. This page was last modified on 18 January 2015, at 17:36.